It’s one of the most memorable nights for all Wildcats, when families travel from across the world to mingle with some of the most important bigwigs on campus and a few thousand graduating students. Not to mention, it’s been an academic tradition for more than 120 years. “The vibe in the office leading up to Commencement is nervous excitement, brought on by the desire to create a successful celebration for graduating students, their families and their friends,” said visual designer Dann Niegocki. Pulling off the UA’s most exciting event of the years requires everyone in the office to get involved. 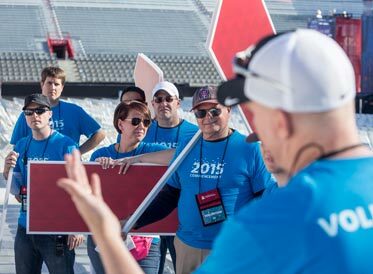 From screen graphics to event planning and an 80+ script with all remarks and stage cues, there is a lot that goes on behind the scenes to make it an unforgettable event. 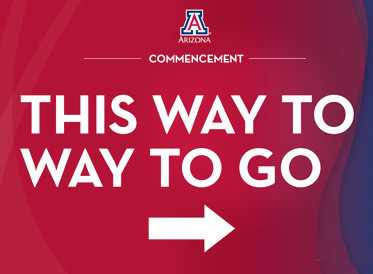 If you’ve ever attended the UA’s Commencement ceremony, you know we take celebrating our graduates to a whole new level. Our ceremony is bigger, grander and a lot more firework-y than anywhere else. Even though we attend Commencement every year, we still tear up once the degrees are conferred. Maybe it’s because we’re filled with emotion as we send another graduating class of Wildcats into the world. Or it could be because we just finished the biggest undertaking of the year and can finally rest easy. Until next year, that is.